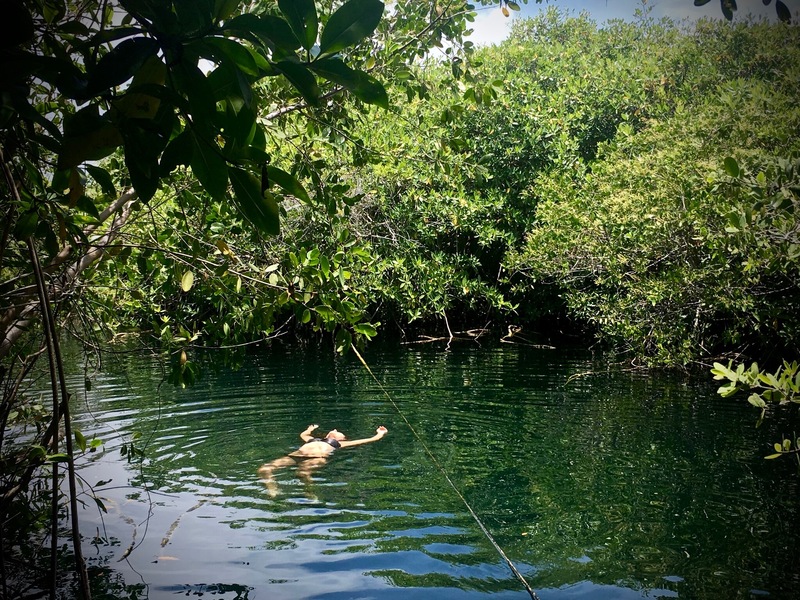 Cenotes in the Yucatan are like stars in the sky. There are over 6,000 cenotes in the Yucatan alone, many of which remain unexplored. A cenote is a large bedrock of limestone that has collapsed into a sinkhole. This collapse often exposes underground caves with swimmable pools of water inside of shallow caverns. The crystal clear waters that spring from deep within the earth sparkle with tones of saturated blues and emerald green. Still and calm like a sheet of thin glass, it felt somewhat consequential to choose to disrupt the peaceful surface, an act that is welcome but not to be taken lightly. Like running into a wise elder and immediately recognizing the need to compose and humble yourself. To find your grace and acknowledge the wisdom being shared with you. There is a sense to act responsibly and remain present. A lovely and loving thought crossed my mind as I entered the delicate waters of these cenotes. I was reminded to approach precious things with precise and concentrated care, to approach with respect- a respect for the earth and awareness of the space we occupy, like taking your shoes off before entering someone’s house as a guest. It was a reminder to give thanks for the beauty and calmness provided and to fully accept those gifts being given by the experience offered. As they say, don’t look a gift horse in the mouth. The most honest way we can give thanks is by being fully present, giving all of our attention to what’s being given to us. Nature provides us with an honest chance to stop, appreciate, and take in the moment with asking nothing more of us in return than our respect and to see things for what they are, uncomplicated. As I pushed my way through the chilly, smooth water, I thanked the earth through simple words and curled lips. I scanned the perimeter to consider its glorious detail, the layers of color and texture, the puffy clouds that lingered, the leaves of trees pressed against gripping roots of mangroves, fast flying birds just barely skimming the reflective layer of water, and the weightless insects dancing on the surface. I let the loud silence ring through my ears while the soft sound of wind rustling the trees swept through my mind, dotted with sweet chirps chiming and singing the gentle song of Mother Earth. A suspended moment of untainted bliss. And then the ego I had so easily left behind at the shore caught up to me. It’s my mind’s instinct to fear the open water, to seek what could go wrong, to let worry overtake and take me out of the water. Certainly, I must know it’s best to stay safe on dry land right next to where I left all my troubles before I forgot all about them and fell under the spell of the beauty before me. What were all the creatures around me anyway? Where and what were all the things I could not see? Things could be lurking and I am unsure of how deep the depth of this sinkhole runs. It’s clear it doesn’t run deeper than my deepest fears though. As I let my ego slam into me and weigh me down I could feel it stealing away my joy while simultaneously wrapping me in that comfortable feeling that comes with fear. Fear masquerades in our minds as a cloak of protection when really that cloak was what was causing me to drown and not all the things I was worried might actually cause me harm, the things that only existed in my mind. The truth was that the only things surrounding me in that moment were peace and love. The ego, however, can’t stand to be ignored like that. It’s quite the conundrum when you think about it. And all that thinking is tiring and it’s easier to just give in, get out, and move on with the day. Fear makes us believe we’re in control and acting responsibly but really it’s just a ploy to keep us from our own happiness. Us humans are funny like that. So I swam and I worried and struggled in and out of love with myself and the beautiful surroundings. I fought with all my might to keep myself from joy and I responded back with a conscience choice, I chose love and peace over and over until it won. I confronted my mind’s small fear of the unknown and turned on my back unraveling from the ego’s heavy but comforting cloak to face to the sun, open my chest to the sky, to the unknown, eyes closed and trusting. I let go of the heavy weight of my fear-fed ego and let the weightlessness of love return and keep me effortlessly afloat. We only float in water when we surrender to it, and so I did. In ebbs and flows my ego made appearances demanding attention. It raced through my veins and hurried my breath. That’s ok, I let it pass. Be still, be calm, be with love.